Midges are on the way! We have only two spaces left in the fly tying class with Guide Jason du Pont. It is from 11:00AM till 2PM this Saturday, the 26th and is limited to six so please give us a call at 410-329-6821 or drop us a line at info@backwaterangler.com to pre-register. This entry was posted in news on January 24, 2008 by Theaux Le Gardeur. While fishing a quiet stretch of the Gunpowder River on Friday, I noticed a good stonefly hatch along the banks of a small glide. The size #16-20 stonefly adults crawling along the rocks, logjams and snow banks could easily have gone unnoticed as there were only two to three winged adults per foot spread over both banks. Few of the adults were flying about, as most were engaged in the act of mating or crawling on the snow. The sun was at just the right angle and intensity for a series of days to cause the stoneflies to emerge. Most of the stoneflies were a size #18-20 with a black body and mottled gray wing. A few larger size #14-16 dark brown stoneflies with a tan mottled wing were also present. This video short shows an up close look at these often elusive winter insects on a 42 degree day with bright sun. 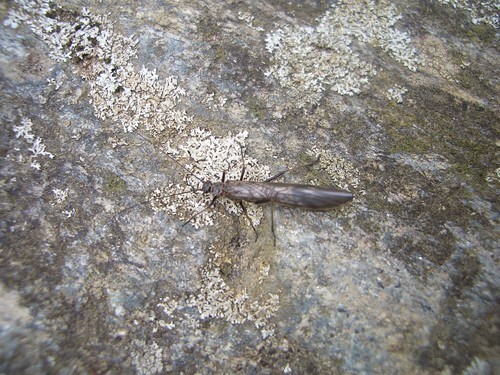 Even with an abundance of insects, anglers walking and looking for rising trout may not notice a stonefly hatch. The adults tend to crawl more than fly and can remain unseen amidst the debris on the water’s edge. A single stonefly in flight, may not appear as much of a hatch, but may indicate that many more are present on the banks. Under ideal conditions, adults gather along the river’s edge and take to the wing in spurts, cued by mating and optimal conditions, bringing numerous trout to the surface. The trout feed in sporadic bursts as the adults land in the water and may not rise until the next group of adults repeat the cycle. The cycle of rising trout to naturals can occur a few times an hour or more if the hatch really gets going. The sun and air temperature help determine this, but I have had good days when the air was in the upper 50s with intermittent sun, or in the low 40s and bright sun. Sections of river in direct sunlight over a series of days will have more insect activity, than areas shielded from the sun by hillsides. 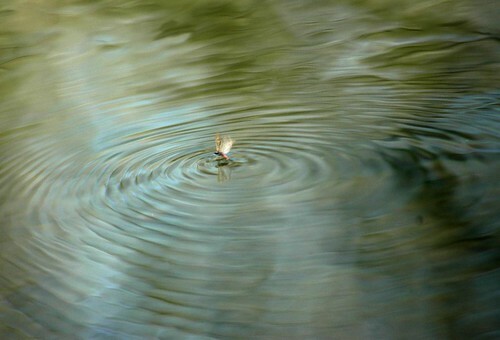 On days when the trout are rising to stoneflies or midges the dry fly action is exceptional. Nymph fishing is effective all winter on the Gunpowder, but extremely effective when stonefly adults are present, and few fish are rising. 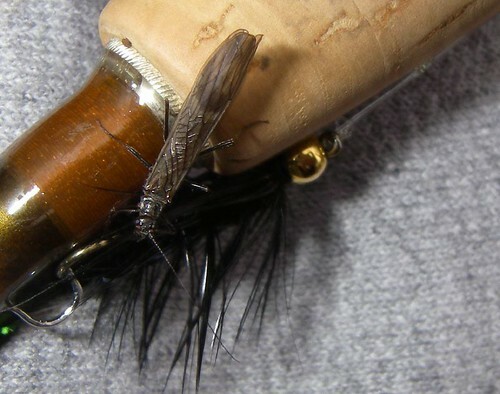 Small black pheasant tails, wire nymphs, and sunk adult stonefly patterns are best fished close to banks, rocks and log jams. A size #18 black PT nymph produced five browns in quick succession at one pool where the bugs were hatching. The surface action never really got going that day, but the action on nymphs was steady in deeper areas. This entry was posted in fishing report, video on January 24, 2008 by Jason du Pont. Gunpowder River Guide Jason du Pont just brought in a test tube full of adults sized #16-20. Look for an upcoming Stonefly video on BACKWATERANGLER.COM and stay tuned! This entry was posted in fishing report on January 19, 2008 by Theaux Le Gardeur. 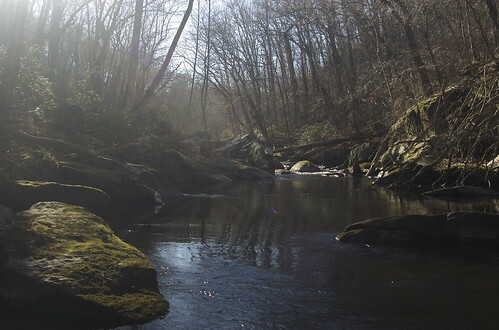 I recently attended a MDTU meeting at which Charlie Gougeon from MD DNR fisheries reported that after a gauge malfunction, some icing and a partial blockage of the cone valve, the Gunpowder Falls River is back up to 30 CFs. Black flies in the #20-22 range are worth a shot above Falls. This kind of fishing, tiny dries, low water, and spooky fish in beautiful surroundings, is challenging and worth it. We just received some great new patterns from Mike Bachkosky that should work fine on 7x. Low water means more stealth, it might also mean waiting until midday try your luck. Stoneflies are just around the corner and we have some nice hairwings in that should skate in the riffles like mad. We also received the latest report on the Gunpowder River Annual Shocking Survey results that I’ll be sharing in detail in another post. This entry was posted in fishing report on January 18, 2008 by Theaux Le Gardeur. 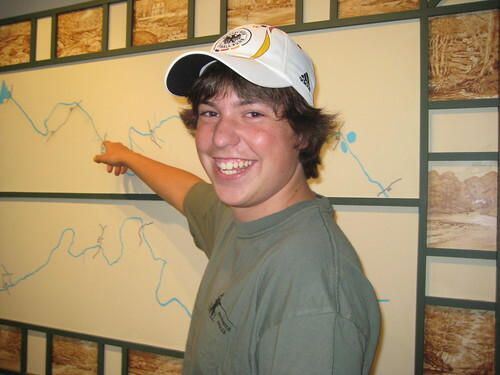 Stop in Monday, January 21 and ask Max how the fly fishing is in Chile this time of year. We’ll be in the shop from 10AM till 4 PM on Monday. This entry was posted in events, news on January 18, 2008 by Theaux Le Gardeur. We Still Have Room in the Stonefly Tying Class! Stoneflies are on the way! We have only three spaces left in the fly tying class with Guide Jason du Pont. It is from 11:00AM till 2PM this Saturday, the 19th and is limited to six so please give us a call at 410-329-6821 or drop us a line at info@backwaterangler.com to pre-register. Our Maryland Fly Patterns for Beginners Class on Feb 16th is full and we’ll be adding another soon! Backwater Angler is Now Open Every Wednesday, that’s 7 days a Week! That’s right folks, not only can you fish the Gunpowder mid-week but now you too can stop by the shop on Wednesdays. For some it’s a regular day off, for others it might need to be a sick day if these warm temperatures keep up. Last Wednesday we gave away hats to celebrate 7 days a week in our 7th year. This Wednesday we’re giving away t-shirts and hats until they’re gone. This entry was posted in news on January 8, 2008 by Theaux Le Gardeur. It’s 72 F in January! The river is much colder at 42 F. The water is clear and the edge ice has melted. Dave Gerhardt at 94 years young, bought his Maryland fishing license today while he was in the shop and told us that he was fly fishing today and saw fish rising below Masemore Rd. We also had several calls today from lucky anglers from Pennsylvania. John and a friend drove all the way from Lancaster, PA to try their luck with stonefly nymphs and soft hackles and caught a number of fish. Small nymphs, brassies and zebra midges rounding out their offerings. Those hoping for midges went all the way upstream to Falls Rd. Several reports from anglers of Bats eating midges in broad daylight are telling. ICSI midges are a good bet as are tiny BWO’s, but most fish this time of year are keying in on size #20-22 blackflies. Blackflies look best on a 12 ft leader ending in 7x, so make your leaders long and light. If you have trouble with long leaders collapsing, try picking up a few hand-tied leaders next time you’re in the shop. Downstream, below Bluemount, small traditional streamers are also a good bet as the young of the year, by now in the pinkie to index finger size range, don’t have many places to hide. Little Black stoneflies are buzzing but not in enough numbers to get the fish looking up yet. In a week or so and we should have consistent dry fly fishing in the riffles. The water is super low and the last accurate gauge reading, (before the malfunction) was 20 CFs. So limit your wading, have fun and remember that driving a dirty car will help conserve water. Since the end of October the water level in Pretty Boy has moved up four feet and the reservoir is still down twenty feet from crest. I took advantage of the warm temps yesterday and fished the GP with decent success. Fish were consistently rising/sipping from 12-4 in the slower midge pools. I landed some nice ones on really small ICSI midges, Griffiths Gnats and 7x. Not bad for January. No sign of black stones however. To Cold to Go Flyfishing? Think Again. This entry was posted in fishing report on January 7, 2008 by Theaux Le Gardeur. Sharkskin Fly Line from 3M Scientific Anglers in Stock! New lines always promise high floatation, extra distance and slickness to improve casting. 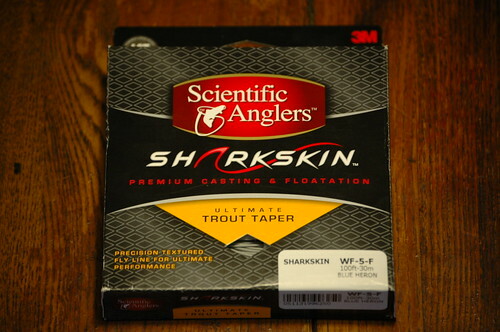 One of the most recent lines to hit the fly fishing market is the Sharkskin Line in the Ultimate Trout Taper from Scientific Anglers. The blue heron colored line has a gritty feel, which is actually a precision textured pattern that raises the surface area of the line off the guides. The idea is that the less line surface area contacting the guides during casting will mean less friction and more distance. The first noticeable attribute about casting the line is that it creates a sound, as the fine grit on the line contacts the guides. The sound is similar to a zipper on a tent being opened or closed, as the line is stripped in or cast through the guides. The Sharkskin’s second most notable attribute is that it shoots really, really well. The line’s slickness is a step above most other lines and the textured surface no doubt offers extra distance, although it is not a replacement for poor casting abilities. Once the rod is loaded properly and line is released with the correct timing, the line “sings” through the guides on way to its target. The Sharkskin line has a longer head than many other popular lines we carry. Shorter, heavier heads such as Airflo’s Ridgeline, Joan Wulff’s Triangle Taper or Rio’s Clouser Line load faster action rods more quickly with less effort. Airflo’s Ridgeline uses a similar line surface technology which loads stiffer rods more quickly, and is ultra slick without producing any sound while casting.The longer head on the Sharkskin line requires more fly line to load faster action rods properly. Short, stiff, fast action rods may not be the best choice to pair with the Sharkskin Line, unless the caster’s style is extremely aggressive and distance oriented. Fishing larger rivers or streams which allow casting at greater distances would be a good fit for this line. The line would excel on softer action rods and bamboo where casting dry flies twenty to thirty five feet is common. After numerous days of fishing the Sharkskin line on the Gunpowder, the line does float high, is extremely slick and can no doubt add distance to casts. The line “singing” during casting may turn off some anglers, or the line may not be a good fit for nymph fishermen who rarely cast for distance in the traditional sense. The Sharkskin’s long head made for tough roll casting and “flip nymphing” fifteen to twenty feet of line, although the line is designed more for distance than nymphing. We have demo lines spooled up in the shop for four and five weight rods for anglers interested in casting this line out back. Purchase a SA Sharkskin Fly line on our secure site. This entry was posted in gear, reviews on January 6, 2008 by Jason du Pont. Still have some holiday cash burning a hole in your pocket? Stop in the shop this Friday through Sunday and take advantadge of great savings on in-stock clothing, luggage and wading products from Patagonia and Cloudveil. Save 25% on all in-stock Patagonia items including luggage. Save 35% on all in-stock Cloudveil items including waders and wading pants. Shop early, shop often and thanks for your patronage! This entry was posted in news on January 3, 2008 by Theaux Le Gardeur.